I'm guessing it's a combination of Coffee Storerooms and DIY Shuttle Kits. We know, for instance, that there was no Aeroshuttle installed. Voyager's mission should have been quick and easy: she embarked with a new crew, new captain and new starship design into unknown territory on a mission that ws likely more a chance to shakedown the crew and ship than to really solve the ongoing Maquis problem. 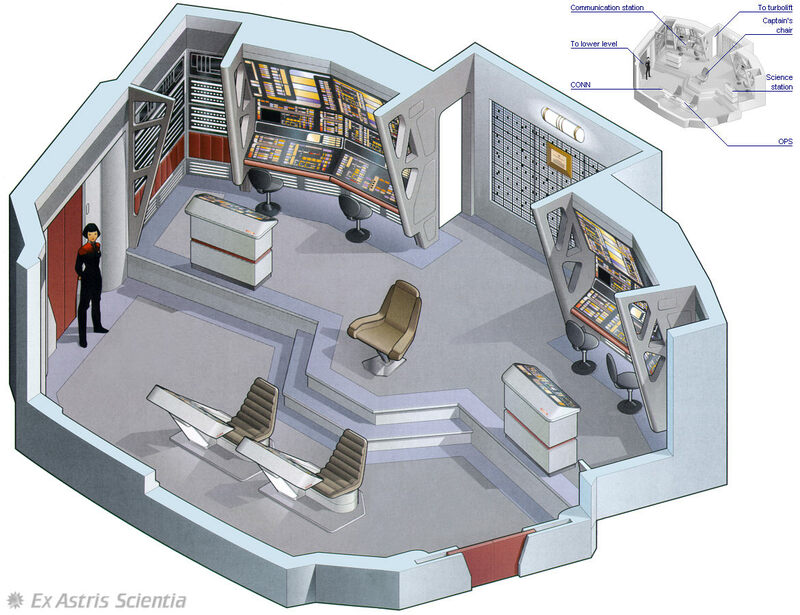 I think that Voyager was only partially equiped and had a lot of interior space left unfinished. Plus double-bunking the junior members may have served a morale issue (lonliness) and have given Ensign Sudor more of a challenge. Well, two weeks later, I think I may have finally put a face on this topic rather than a topic based solely on a hazy recollection. I did my best to get a 'pan' of the bridge between the jolts and flashs...picture #5 appears to be the ops officer/post. Sure looks like a main bridge (and NOT a battle bridge) to me. Well it is at least almost a 3/4 bridge and it seems they went as far as an ops officer despite a split second of camera time. Otherwise the whole, wrap-around ramp with the 'tactical rail' is very Galaxy main-bridge. The only major differences I see is 1.) that there is that door that appears to be midway between where the ready room and the turbo lift would be, 2. )the far-left-back of the bridge seems deeper, and is all 'stand up' computers in the back, and evidently not the 'sit down' consols along the back, 3. )the captains chair seems to be more foreward than the first officers chair. I actually think of those as improvments to the Enterprise bridge. ...but I thought Voyager had 45 shuttles. So....you can make me a MSD? I actually did that a few years back, though it didn't look so hot. So instead, I'll point you to the bridge of the Nebula-class Prometheus, the set's previous appearance. All you have to do is put another couple of stations where that grille is, with opaque bulkheads where the upper monitors would be. Swap out the port and starboard consoles for the big tactical rail, and STEPS (not ramps ) on the sides to get up and down. The aft doors are probably still there. Remove the second step where the CO chair is, move it forward on an expanded first step up, and pop in two more slightly behind it. In my sketch, I put in a small situational table a la Defiant between the two chairs behind for them to work. The forward consoles and p/s exits remain the same. See? Not terribly pretty, but it works. In addition to the uniforms, further proof that Starfleet is sizist - imagine trying to squeeze through that alleged turbolift door. . .